The story here is very much the same as the 1991 original’s, though writers Stephen Chbosky and Evan Spiliotopoulos make some changes to the plot that turn out to be a mixed bag. At best, additions such as Maurice’s (Kevin Kline) secretive past and the enrichment of the relationship between Gaston (Luke Evans) and LeFou (Josh Gad) humanize these characters and thus make them more compelling. 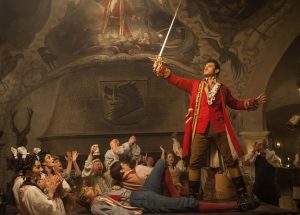 At worst, some – like the Prince/Beast’s (Dan Stevens) upbringing – are rendered pointless or even detract from the story, and nothing encapsulates this more than a certain character who acts as a deus ex machina in the finale, made worse by the fact that she is awkwardly and noticeably inserted into the plot at various points. A handful of character flourishes work out well, particularly the comic beats that give the transformed servants much-needed lift. 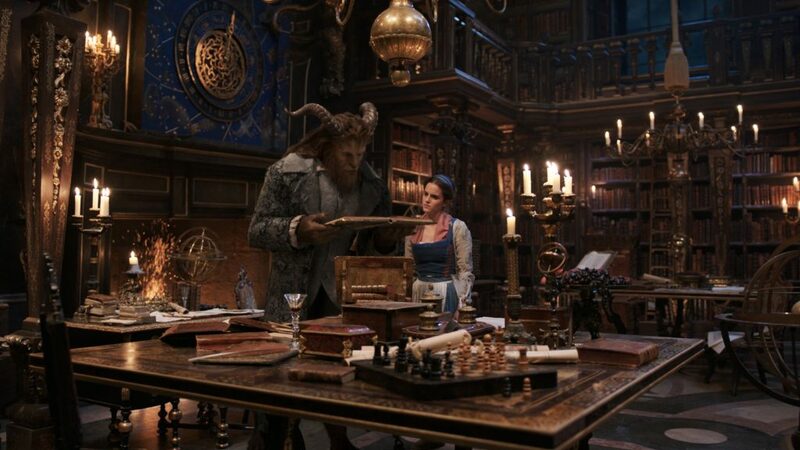 The film is over 40 minutes longer than the animated feature, and it invests most of that extra runtime in the aforementioned changes rather than the relationship between Belle (Emma Watson) and the Beast, which could be fleshed out so much more since it’s supposed to be the main hook. While the two do share some genuinely terrific moments, it’s difficult to buy into their rushed romance. The same goes for the relationship between the Beast and his servants, as their scenes together lack the necessary affection and spark. I have no doubt that each of the actors care about their characters, but only a few soar here. Watson is best when she puts Belle’s personality on full display or acts opposite other cast members in the flesh so she can play off of them. She isn’t as expressive as she should be when reacting to the transformed servants, as seen in the “Be Our Guest” musical number, where she doesn’t seem to be entranced by what is unfolding in front of her. 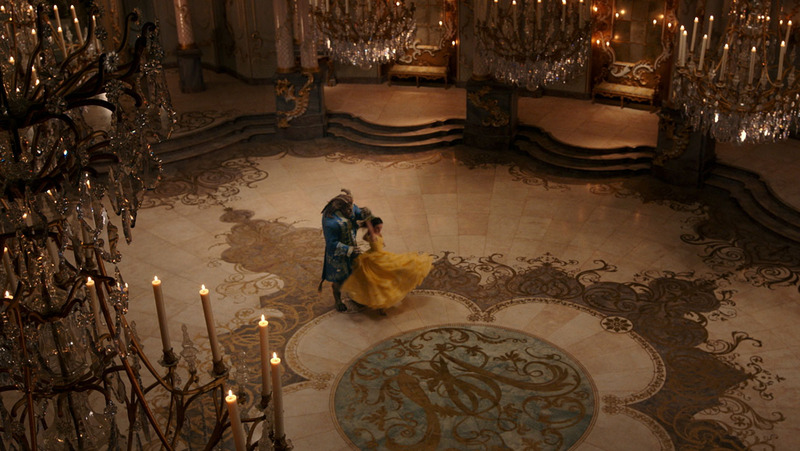 Unfortunately, her singing voice is auto-tuned, which is quite apparent from the moment the song “Belle” begins. Stevens certainly does his best to make the Beast a breathing character deserving of our empathy, but the facial design limits his motion-capture performance; not once do we forget that we are looking at an animated and stiff face, and the Beast’s humanity doesn’t come through it enough. Sharing an irresistible chemistry and stealing their scenes, Evans and Gad have immense fun with their roles and effortlessly radiate their characters’ personalities from beginning to end. Kline’s gentleness serves his expanded role very well, and he coaxes others like Evans, Gad, and Watson to give their performances their all. The cast members playing the servants are merely fine (Audra McDonald is the highlight out of this group), and it’s a shame that their characters aren’t granted enough room and time so that they feel larger than life. As a musical, the film boasts impeccable design, but oftentimes feels hollow. The better musical numbers like “Gaston,” “Evermore,” and “The Mob Song” burst with energy and focus on the characters first and foremost. 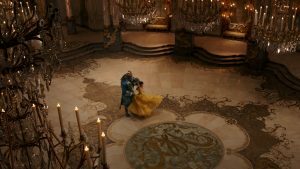 The worse ones, particularly and shockingly “Be Our Guest” and “Beauty and the Beast,” make sitting through the film a chore (I would even describe them as boring) since Condon choreographs them to show off the visual flair. Sure, Sarah Greenwood’s breathtaking production design and Jacqueline Durran’s pretty costumes are sights to behold, but they aren’t meant to sustain the entire length of a number by themselves. That’s what the characters (the human ones, I mean – the transformed servants are merely visual creations that are underdeveloped as characters) are for, and when the spotlight moves from them to their surroundings, that’s when I lose interest in what’s going on. In addition to the songs from the original film, this flick features four new songs: “Aria,” “How Does a Moment Last Forever,” “Days in the Sun,” and “Evermore.” All of these are forgettable except for “Evermore” – while it is expository and too on the nose, I enjoy listening to it. 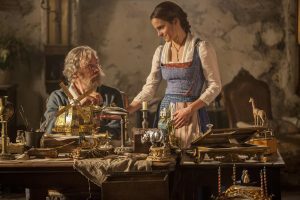 The live-action Beauty of the Beast occasionally shows flashes of heart, but as a whole, it feels flat and incohesive. I decided not to revisit the animated version before heading into this film partly because I wanted to give it a chance to hopefully shine on its own terms without having to keep comparing it with its predecessor, yet I found myself doing just that afterwards. In its efforts to be more, the film becomes less.